Southwest Museum of Clocks and Watches, Lockhart, Texas. Thanks in part to an inspiration that came to horologist Gene Galbraith during the early morning hours of a cold and rainy January 13, 2007, the Southwest Museum of Clocks and Watches now resides on the historic square in downtown Lockhart, Texas. Galbraith, the founder of the museum, was lying awake mulling over various ideas to increase public interest in horology, the art and science of making timepieces, when he came up with a vision of establishing the clock museum. By March, Galbraith had assembled a board of Directors, and on April 9, the Museum was officially organized as a Texas Nonprofit Corporation. With the official paperwork out of the way, Galbraith next turned his attention to a public relations campaign to make people aware that a clock museum would soon be coming to the central Texas area. Galbraith had been under contract with Caldwell County since 2005 to maintain the Seth Thomas clock in the courthouse tower, and this business arrangement would prove invaluable in promoting his vision of the museum. 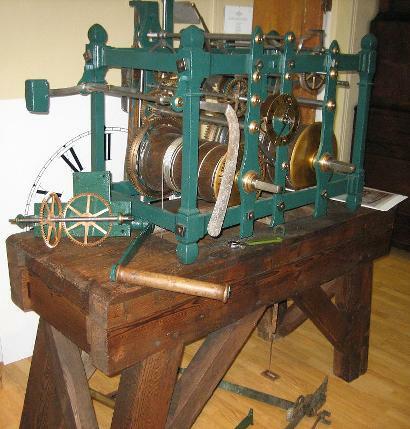 What better way to build public awareness of clocks than to stage a Tower Clock Open House. The program would begin with an educational program presented in the historic Caldwell County Courthouse, and conclude with guided tours of the tower's seventh floor to view the great Seth Thomas clock. People from Lockhart and all across central Texas turned out to view the clock, and the Open House was a resounding success. The gala event also served to bring the city of Lockhart to the attention of clock enthusiasts throughout central Texas who appreciated the historical significance of the setting. As Vice-President of Southwestern Chapter 15 of the National Association of Watch and Clock Collectors, Galbraith was in charge of organizing and promoting the 2007 convention in Kerrville. 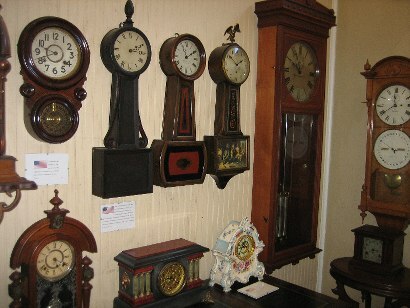 He used this platform to go public with his plans to establish a clock museum in the spring or summer of 2008. Then later, after he was elected as President of the organization, he was able to use the prestige of his office to promote the museum and add credibility to his leadership of the project. 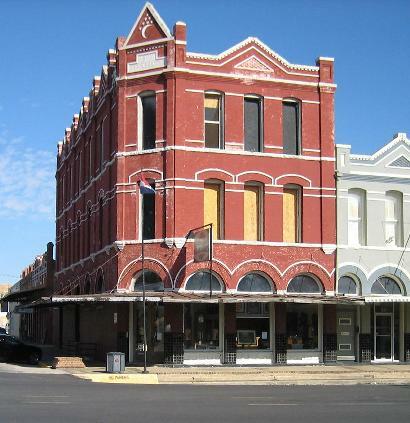 The final step was to find a suitable location for the Museum, and this task was accomplished by leasing the majestic Brock Building on the northeast corner of Main and San Antonio, across from the courthouse on the historic town square. The Brock Building was constructed in 1898, four years after the Caldwell County Courthouse. Registered as a National Historic Landmark, it was the perfect site for a museum dedicated to the preservation of historic timepieces. After more appeals to raise money and much more hard work, both paid and voluntary, the Southwest Museum of Clocks and Watches officially opened its doors at 9:00 am on March 29, 2008. "Caldwell County Courthouse Old Seth Thomas tower clock - 1894"
When visitors step through the front door of the museum the first exhibit to catch their eyes is a beautifully restored tower clock. The clock is in fact the original Caldwell County Courthouse clock. 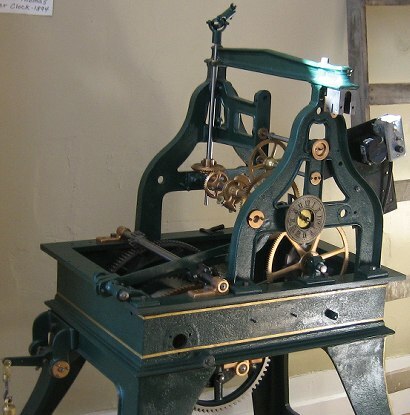 The 1893 Seth Thomas Grandfather Time stopped working in 1993 and was replaced by an almost identical, but twenty years younger, salvaged clock purchased in Ohio. When Gene Galbraith learned the old clock had been disassembled and put to rest in the dirt basement of the Tax Office, he set out to restore it. Nearly three years later, in time for the Museum's 2nd Anniversary Celebration, the Seth Thomas Grandfather Time was on exhibit in the front gallery. There is also a gift shop at the front of the museum that sells handcrafted jewelry, as well as exquisite estate jewelry items on consignment. In addition to the old courthouse clock, there are many other exhibits in the museum that will surely catch the visitor's eye. Hanging on the wall to your right as you start down the gallery is a pocket watch that once belonged to a Union soldier. Dented by the mini ball that killed the Yank at the Battle of Stones River in Tennessee, one of the bloodiest fights in the Civil War, the watch is still set on the time of the soldier's death. Next on your left is the Early American gallery dominated by three Seth Thomas clocks, and a small circular table with carved pictures of George and Martha Washington, and Washington's lifelong friend, the Marquis De Lafayette. There is also a collection of "banjo" wall clocks, so named because they take the basic shape of the instrument. 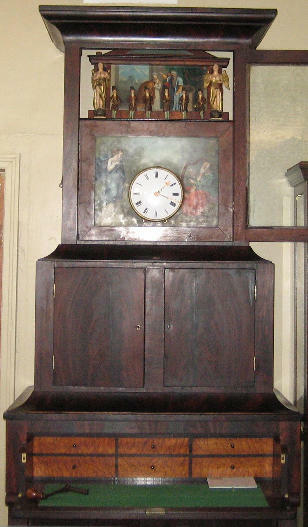 A replica of a Benjamin Franklin clock stands in the corner. After the Early American gallery is a gallery of French and German clocks. The ornate carving in the woodwork of the German clocks easily distinguishes them from the French, but the entire collection is interesting, and quite beautiful. Further down the gallery is a clock made entirely of wood, including the gears that operate the time piece's mechanism. It seems brass was in short supply in early 19th Century America and thus expensive, so Eli Terry came up with the idea of manufacturing wooden clocks that more people could afford. At the rear of the museum are two interesting exhibits: one is an 1850 Thwaites and Reed tower clock from a building in England that was bombed out during World War II. Having been completely restored by Galbraith and his assistants, the clock is now fully operational, and plans are in the works to create the museum's own version of a tower clock. Standing alongside the tower clock is a tall combination desk, clock, and fancy music box with miniature hand-carved musicians and angels that once belonged to famous showman P. T. Barnum. Above the desk is a coin slot Barnum cut into the clock so visitors to his home could pay for the privilege of hearing the music and seeing the miniature musicians in action. As well as exhibiting historical clocks and watches, Galbraith restores and repairs antique time pieces in a small workroom at the rear of the museum. Larger jobs are accomplished off-site at Galbraith's home west of Bee Cave. 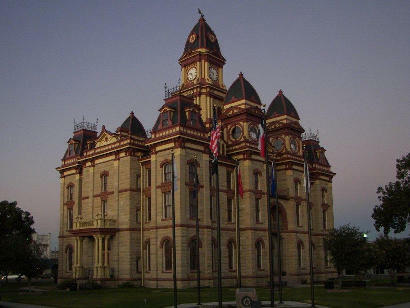 The museum also has an agreement with the Texas Historical Commission to repair and restore courthouse tower clocks. Currently, Galbraith and his crew are restoring the Hood County Courthouse tower clock in their off-site facility, and the museum's proposal for the Cooke County Courthouse Tower Clock Restoration was recently approved. After the Cooke County restoration is complete, the great clock will be on exhibit in the museum for a year. For a unique historical experience, I highly recommend a visit to the Southwest Museum of Clocks and Watches in Lockhart. You will experience a glimpse into the art and science of horology that is both entertaining and informative. Dan Sweet, a volunteer docent, gave me an enjoyable personal tour, and either he or one of the other museum volunteers is standing by to do the same for you. Take the time to wander through this historic city landmark. You won't regret it.